Multiple sources of variability are causing unexpected problems in everything from AI chips to automotive reliability and time to market. Variation is becoming a bigger challenge at each new node, but not just for obvious reasons and not always from the usual sources. Nevertheless, dealing with these issues takes additional time and resources, and it can affect the performance and reliability of those chips throughout their lifetimes. 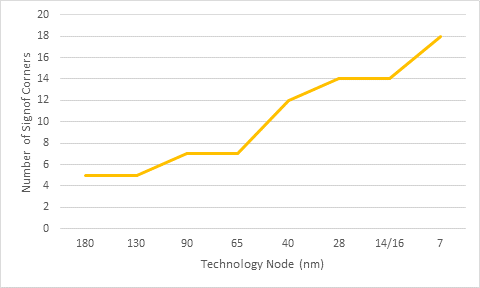 At a high level, variation historically was viewed as a mismatch between what design teams intend to be in a chip versus what actually shows up in the manufactured chip. Foundries provide a set of process rules, which are used by EDA companies and designers to adjust for those discrepancies. Design teams and fabs then typically add their own guard-banding to ensure the chip functions as expected and that all possible corners are addressed. This approach is becoming more difficult to sustain on multiple fronts. The number of process-related corners has been rising steadily over the past four process nodes (see Fig. 1 below). Along with that, the tolerances for noise of all sorts have been going down at each new node due to increased power and transistor density, thinner dielectrics, and more circuitry that is always on. To make matters worse, there are more sources of variation, and there are many more types. Lithography is an obvious starting point for any discussion about process variation because it was the first place where variation became a major issue for the entire chip industry. The greater the transistor density, the more mask layers that are required, which almost guarantees that variation will creep into the process. That is true whether it involves EUV scanners, which can vary from one to the next, or the 193 immersion process, where multiple masks have to be overlayed to achieve a single image that could be done in one pass using EUV. In addition to process variation, there are variations in the masks themselves. Photomasks are developed for a specification, and that spec includes an “error budget” assigned to the mask manufacturing process. So the mask incorporates the error budget for both the mask and the wafer processes. One area of particular concern is how the various mask layers go together. In the past, the ITRS was used to coordinate error budgets and tolerances. Since it was abandoned, the industry has been struggling for a consistent way of addressing these problems. Statistical models are being studied for future development, but so far the industry is sticking with what it already has. Lithography is just one slice of the variation pie, which is comprised of acceptable levels of distributions from a number of different areas. Increasingly, that includes materials, which has its own separate supply chain. At each new node, that becomes more difficult to deal with, as well. The entire industry has been shifting from pure observation through inspection and metrology to a combination of observation and data analysis. That is being augmented by machine learning, where the goal is to establish a distribution of acceptable variation parameters. Yield is perhaps the least understood aspect of variation because it’s not always a clear-cut cause and effect. There are important business reasons for making that happen. Dealing with variation slows down the entire manufacturing process, which in turn increases the time it takes to burn through inventory. Moreover, yield isn’t as simple as a chip works or fails. Chips that don’t meet an OEM’s spec still may be useful in Tier 2 and Tier 3 products. 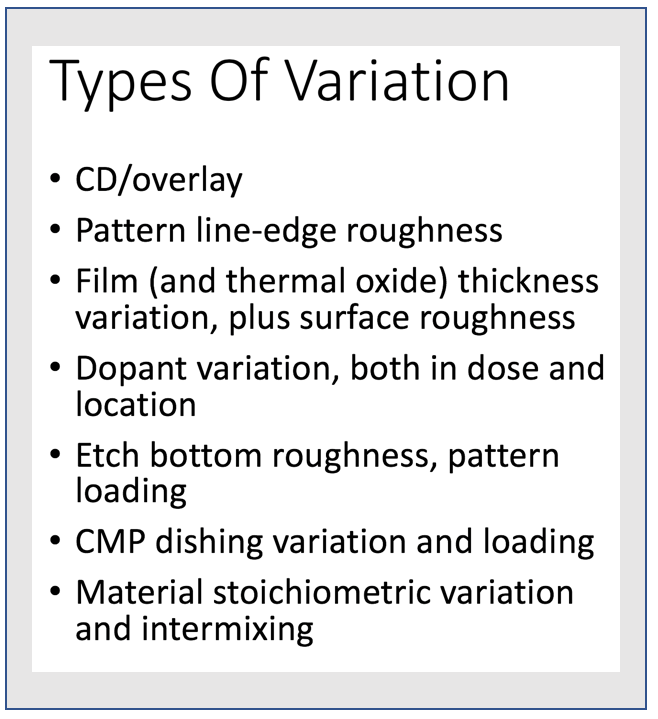 Variation also impacts different types of chips in different ways. The problem is particularly noticeable in some AI chips. And that’s just for AI chips, which tend to be arrays of the same logic and memory elements. Other chips have their own unique problems. While variation affects all process nodes, the biggest challenges are at the most advanced nodes because the processes are still not mature. This is particularly problematic in automotive electronics, where OEMs and Tier-1 suppliers are developing systems for assisted- and autonomous driving based on 10/7nm technology. Still, automotive adds some unique twists because of the environmental extremes and the safety-critical design requirements. This marks a big change for the automotive industry, in particular, where advanced-node chips are being used in the logic of assisted and autonomous designs. Not everything in automotive is moving to smaller nodes, however. In some cases, technology is moving in the other direction because of variation. Still, this requires some complex tradeoffs. “You can minimize every variation effect with six-sigma design,” said UMC’s Chen. “But you also can achieve the same with three-sigma at an older node. The chip is bigger, but it’s more stable and you can minimize variation. So on a 12-inch wafer, you may get better uniformity in the center, but around the edges this is more difficult. If you move from 300mm to 200mm you minimize the variation. Finding variation-related issues when something can be done about them is harder than figuring them out after the fact, when data that is collected during manufacturing can be analyzed. There are other effects, as well, that aren’t in the rule decks. Variation is not a new phenomenon, but it certainly is an increasingly important issue. While this won’t curtail designs at the most advanced nodes, variation imposes yet another set of hurdles that drive up the cost. And while some of this could be ignored in the past, a lot more people are paying attention these days. 7/5 nm is now believed to require multiple patterning even for EUV.